I’m already shifting uncomfortably in my chair at the prospect of being labelled “un-Australian” as I begin to share my take on Australia Day. Not only because there’s no such thing, but I couldn’t be un-Australian if I tried. Yet I’m not about to start “Oi, Oi, Oi-ing” all over the page either. Nor am I about to go ripping on the bogan, either. Far from it – I is one! I have worn a mullet in the past. Been ejected from a ZZ Top concert for smoking (“B&H Special Filter only, officer. I swear.”). I’ve paid enough tax on ciggies and grog that I believe I personally played a big part in keeping Australia out of recession during the GFC. A lawyer who specialised in finding loopholes, finding that obscure British relative born in Cardamom-on-Thyme…but not I. Now, I’m not claiming “convict status,” but the words “assisted passage” on some yellowing documents say to me that some of my ancestors might not have been completely willing immigrants. Another yarn has it, my great-great grandfather, a Pom, working on a merchant ship in the 1800s, was waiting to berth in Newcastle, but he flung himself overboard and swam ashore at Stockton to begin a new life. A queue jumping, boat person he apparently was. There is no record of his arrival in Australia. Alas, the Poms wouldn’t take me. Even though I was never going to stay long. I just wanted to earn a bit of coin to aid me in chasing a bit of tottie around London and drink a few pints. I wasn’t offended as much as I was disappointed that I couldn’t spend more time whinging about the cold and wet. So I came home to Aussie after I’d visited as a tourist. In the greatest country on earth I have remained, and have since added to the family bloodline with a little boy conceived on, wait for it…Australia Day. He’s going to have his fair share of birthdays fall on Melbourne Cup Day too, so he’ll always be my special little, very Aussie hero. Other than knowing I “got one through to the keeper” one year and even with my particularly white/Anglo heritage, I don’t feel anything particularly stirring about Australia Day. Maybe I would if my ancestors arrived with Captain Arthur Phillip? I don’t know. Australia Day is a good thing, don’t get me wrong. A day off work is to be cherished and held dearly, but I don’t feel the need to do anything special. Nothing I wouldn’t do on any other day anyway (work, weather, the missus and common decency permitting). I fire up the barbie at the drop of a hat. I crack beers and watch cricket on the telly without any encouragement. But I don’t want to build a raft made of thongs. I don’t want a little flag on my car and I don’t want to get my bogan on and try to “out-Aussie” the next the bloke. It’s odd. I’m more proud of Australia on the other 364 days, rather than the one day each year that can often expose intolerance, idiocy and violence in some buffoons. You know, the ones who claim “we are full” amongst other classic, witty, highly researched facts? Admittedly, I myself got a bit angry one Australia Day, when a thug at the beach thrust the Australian flag in my face and told me to kiss it. That I’d be un-Australian if I didn’t. It’s this ignorant and weirdly angry pseudo patriotism that saddens and angers me. 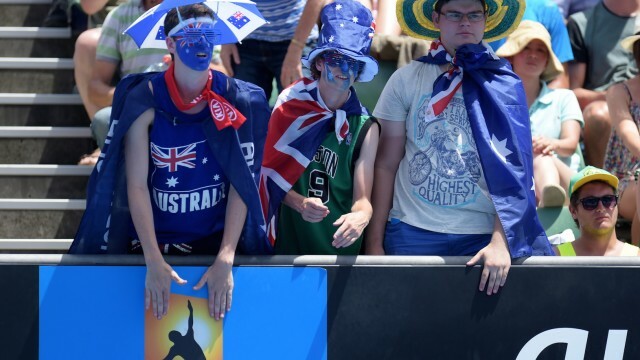 My defensive, growling decline to kiss the flag that Australia Day, and my six feet plus white-ness, probably meant things didn’t turn ugly, but I’ve often wondered how different things might’ve turned out had I been sporting the old “towel-turban” that day, like I used to do as a kid? Things have become uglier since then. Tolerance of others is at record lows as the media and even our government not only fail to condemn intolerance, but propagate it. NB: I’m not buying into the whole “Invasion Day/Citizens Day” thing either. The notion of Australia Day is fine, as it represents a definitive moment in what shaped our nation. History is what it is. It’s a significant day, but one I wish had matured in a more positive fashion. Australia Day should be a fair dinkum celebration of people coming to a new shore to begin a better life (1788 and since), whilst acknowledging what that meant to those who were already here at the time (no, Mr Abbott, Australia wasn’t “just bush” prior to 1788. You should know that as the Minister for Aboriginal Affairs – stay back after class). Aussies were once known for our ambiguity and chilled attitudes to even seemingly important issues and, I for one would rather a return to that. I’ve always liked the notion that “Australia is the land of the fair go.” Hell, I’d even take outright apathy towards our “national days” over raw ignorance and hate. You know, the kind of idiocy that gets a thoroughly good outing on ANZAC Day as well as January 26? Please, have a “Happy Australia Day!” …with the emphasis on happy. Happy you live in the lucky country. Be happy to share it and celebrate it accordingly…even on a thong raft with an Aussie flag attached if you want.